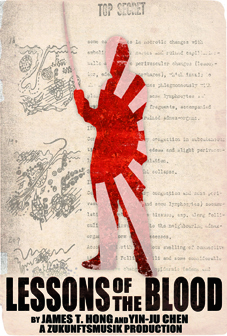 Synopsis: Focusing on the history and victims of Japanese biological warfare, "Lessons of the Blood" is a meditation on propaganda, historical revisionism, and the legacy of World War II in China. Other Cinema, San Francisco, California. Putting Japanese wartime abuses in a larger context, 'Lessons of the Blood,' a sober documentary presented in chapter format by filmmakers James T. Hong and Yin-Ju Chen, analyzes how history is recounted and truth is determined, especially when multiple individuals, some with self-serving agendas, remember the same event in contradictory terms. "The winners have entered the realm of fiction, the losers the realm of documentary," intones the film's narrator. Through extensive research and testimonials, Hong and Chen examine propaganda, historical memory, Japanese revisionism and medical experimentation on Chinese prisoners during World War II, biological warfare and its victims and the lingering wounds of war. Perhaps the most controversial of the locally-connected docs is "Lessons of the Blood," in which James T. Hong and Yin-Ju Chen conclusively reveal the horrors still lingering from Japan's bio-warfare experiments during World War II. During the Japanese occupation of China, Unit 731 conducted experiments on Chinese civilians, the horrors of which are still active in those who survived. It's a corrective particularly relevant in the Bay Area, given that just an hour north of San Francisco, the Travis Air Force base hosts the Jimmy Doolittle Air and Space Museum. As "Lessons" documents, the (in)famous Doolittle Raids in China were among the events whose terrible reality has been obscured by propaganda and mythologizing. Hong and Chen's decision to make the film was sparked by the publication of a new Japanese high school history textbook in 2003 withih which the Nanking Massacre was described as an 'incident' and relegated to a footnote. While working on "Lessons," which took six years, Hong made the 2007 short "731: Two Versions of Hell," which Chen describes as "two different perspectives on one historical issue. You see no talking heads, no interviews, and no human subjects in that movie." Hong's take is slightly different. "The '731' movie was an experiment with some of the footage. There was always the intention of making a longer film that dealt with more historical issues. The issue of 'balance' comes up a lot. But what balance is there when one side just says it isn't true? It seemed essential to me to address the prejudices we have when we hear about China or Japan." LESSONS OF THE BLOOD is distributed by Javafilms.